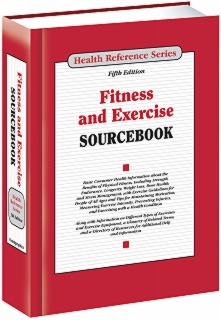 Fitness and Exercise Sourcebook, 5th Edition, provides information on physical activity for people of all ages and diverse fitness levels, including those with disabilities, chronic diseases, or other challenges. It describes ways to make exercise fun and offers suggestions for staying motivated and setting goals. Information on safety concerns, nutrition and hydration, and equipment needs is included. Part I: The Health Benefits of Physical Activity details the health and mental benefits of physical activity, including life satisfaction, disease prevention, increased mental health, and a healthy weight. It also explores the determining factors of health. Part II: Guidelines for Lifelong Physical Fitness offers readers specific fitness suggestions, age-appropriate guidelines, and tips for promoting physical activity among children, teenagers, adults, and the elderly. It concludes with a discussion of the ways in which a community’s environment can promote physical fitness. Part III: Start Moving explores practical suggestions for adding activity to everyday life and for beginning an exercise program. It explains how to create a fitness plan, overcome barriers to exercise, find a fitness club or workout partners, and measure and track exercise intensity and calorie expenditure. It also provides tips on things to consider when joining a gym and for buying exercise equipment for home. Part IV: Exercise Basics includes facts about specific forms of exercise, from basics—such as aerobics and strength training—to individual activities—such as walking, biking, running, kickboxing, football, soccer, racquet sports, aquatic exercise, and bicycling. Mind-body exercises, such as yoga, Tai Chi, and Pilates are discussed along with the benefits of stretching and resistance training. Part V: Fitness Safety offers suggestions about how to be safe during physical activity through warming up, avoiding common mistakes, choosing safe and comfortable equipment, eating and hydrating properly, and preventing sports injuries. It also discusses the risks of overtraining and compulsive exercise and offers tips for exercising safely out of doors. Part VI: Physical Fitness for People with Health Conditions describes specific steps to physical fitness for people with disabilities, people who are overweight, and people with other health challenges, such as heart disease, bone disorders, breathing difficulties, diabetes, or cancer. Part VII: Additional Help and Information includes a glossary of important terms and a directory of organizations able to provide information on physical fitness and exercise topics.